Shelley Ruelle of Un'americana a Roma, knows a thing or two about making it work in the Eternal City - she's been living in Rome since 2001. Here, she offers a few suggestions for any expat-wannabe's who'd like to call Rome home, too. Rome is so many things: chaos, a tiny town that only looks and seems big, a city with more than 2,000 years of history. Rome is gelato! Rome is men whistling at women on the street (foreign women that is, because the Italian ones won't give them the time of day. They know better!) Rome is muscular men dressed up as gladiators in front of the Colosseum. Rome is... Rome is my adopted city and it holds a place in my heart that truly nothing else in this world can compare to. It's not easy to live in Rome so get all that "Eat Pray Love" nonsense out of your head. Living in Rome is about fighting for what you need, getting ripped off until you speak the language well enough to fight back and about fighting for your place in line... for all eternity. But it's also fabulous chats with taxi drivers who can tell you all about the spirit of this city. 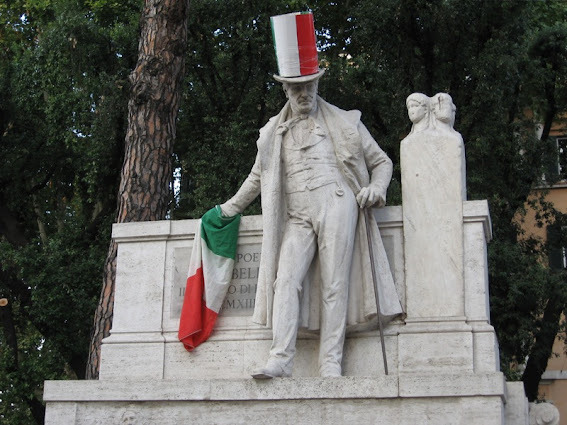 Rome is about poets from the 1800s who wrote hilarious and vulgar poetry in the local dialect. It's about walking around the corner, seeing the Pantheon and never getting tired of it. It's about wearing heels and getting them stuck in between the cobblestones. It's about overpriced aperitivi, beautiful sunsets and kisses on romantic bridges. It's about life itself. 1. First off, do you have an EU passport? You had better otherwise you'll be living illegally here after 90 days. Italy tends to turn a blind eye to Americans who "overstay" their welcome, but I'm not going to recommend it. It's incredibly hard to get a stay permit here. You could enroll in a study program and get a student visa or you could marry an Italian, but seeing as how I'm recently separated, I wouldn't exactly recommend that route. 2. Unless you're being transferred here by an American company your job options could be: teaching English as a second language, which is what I did; becoming a tour guide, which isn't easy because you need an official city license to do so; or translating. If you want to teach ESL, get your CELTA certification. You can do that here at the Accademia Brittanica. Everyone recommends the semi-intensive course because the intensive course is a bit too intensive. 3. Housing in Rome is EXPENSIVE. You can rent out a single room in the center in a shared apartment with one bathroom and kitchen access and you're looking at anywhere from €500 to €700, or $800 to $1000 a month. A good source for finding housing is the all-purpose expat mag Wanted in Rome. It's also a good source for job hunters. 4. A good way to get hooked into the expat network here is online. A lot of us are on Facebook and have blogs so search around and email expats who are already here. Generally we are pretty willing to help other crazy souls like ourselves because we get it. If you have the passion to want to live here, trust me, nothing is going to cure you until you do it. 5. Don't worry about having a car. Public transport is pretty crappy, but you'll have to rely on it. It's still one of the cheapest tickets in Europe - just €1 for 75 minutes and one subway ride. Just ignore the transport strikes that regularly occur on Fridays. I am convinced this is to give the transport workers a nice long weekend. So here's wishing everyone who ventures to Rome a very buon viaggio. Cheers! Or, as we say around these parts, cin-cin! I could never live in Roma. I'd eat pasta every day until I wouldn't fit through the doorways. Quale strada per il Colosseo?